InArt – Community Arts Festival continues to discover artistic projects based on the diversity of the communities and presenting artists who, with their work, draw a bridge between the world and people, in a participative and plural art. Thus, they return to Teatro São Luiz, with performances, films, conversations, workshops and masterclasses, crossing languages, movements and people while reflecting on community art as a movement who is the driving force for new artistic and human landscapes. This project is a cross-generational and integrated dance project working with disabled and non-disabled adults and children. The work will involve live music and performers (dancers and musicians) from Portugal and UK. The work will draw on choreographic and improvisatory structures and open up spaces that encourage deep listening both from performers and audience. The work will celebrate differences –in age; with the youngest performers being 9 years old, the oldest in their 60s, and in physicalities with disabled performers working alongside professionally trained dancers. Adam Benjamin was joint founder and artistic director of CandoCo Dance Company and a pioneer of integrated dance. A founder member of ‘Five Men Dancing’, he has performed and taught with Kirstie Simson, Rick Nodine, Kim Itoh, Jordi Cortés and Russell Maliphant. His book “Making an Entrance” (Routledge 2002) is considered a seminal text and he has written extensively on integrated practice and improvisation. He has received numerous awards in dance (TimeOut, Sainsburys and Prudential with CandoCo). He has been an Associate Artist at The Place, a Wingate Scholar, a Rayne Choreographic Fellow and recipient of an Arts Council International Artist Fellowship. He was awarded a National Teaching Fellowship in 2013 and was named a Change Maker, by the South Bank Centre in 2015. He is part of the Theatre and Performance team at Plymouth University where he advised on the design of the new fully accessible theatre The House. On the silence of the first wave, we are led to dive with our paper bodies into a sea of emotions, images, memories, shadows and promises of plural futures. Between waves and in the immense emptiness of a paper sheet, we are an open book, a white sheet, a canvas undressed by the look, bringing in the body a sea of reasons to celebrate a diversity – Seven waves for seven interpreters, in a wave that connects and embraces. The performance ON THE SILENCE OF THE FIRST WAVE results from a collaboration between BODYBUILDERS and Plural_Companhia de Dança / Fundação LIGA in a partnership with Escola Superior de Dança/Instituto Politécnico of Lisbon. This new creation of Plural deepens its path of more than 20 years in Inclusive Dance with the participation of dancers with functional diversity, final tear students and graduates of Escola Superior de Dança. 3,50 x 2,70 is a measure, perhaps a coordinate of space, lines, walls or borders, where men and women confront their fears in a play of words, but without words. These multiplied men and women are only two, and between movements and sounds they travel in dreams where what separates them, is nothing more than themselves. This is the battlefield of a war of contradictory feelings, of confrontations with reality lived and dreamed, where they protect a space that, after all, who does it belong to? What keeps them here is exactly the will to communicate, to listen and to kill what separates them. 3,50 x 2,70 [three and a half two seventy] tries to question the space of the other, the borders, from the inside out, from the outside to the inside, in a search of a common language where silence, words and gestures don’t belong to no one. 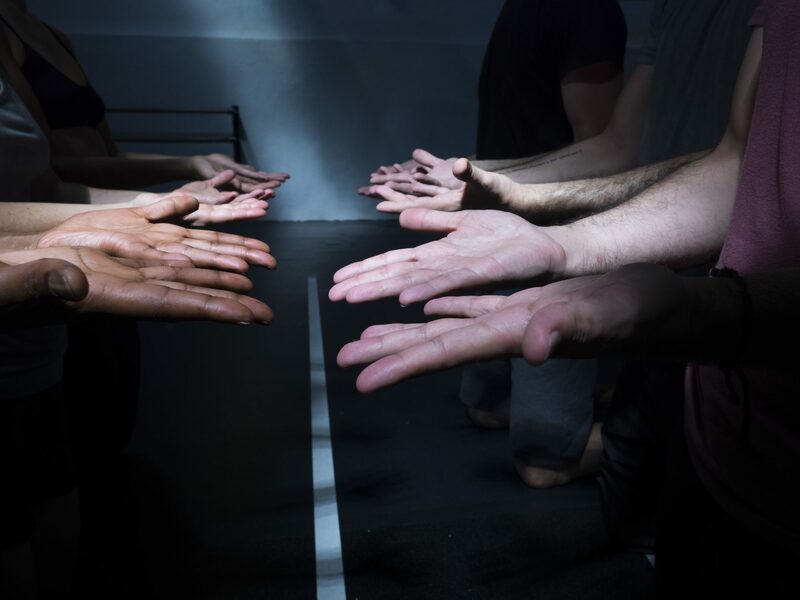 3,50 x 2,70 [three and a half two seventy] is a creation of Ana Rita Barata and Bruno Rodrigues/ CiM – Dance Company, interpreted by six deaf actors and listeners. This piece is an adaptation of the original piece of Eero Enqvist Kukunor ja Unikuu (original title in Finnish adapted to English as “Guardians of Dreams”), within the European project Sign+Sound Theatre (Creative Europe Programme – European Commission).This project’s main objective is to promote the Deaf Theatre at European level and, in particular, the pioneering method of IBT – Innovative Bilingual Theater. This method explores new ways of creating inclusive art for an inclusive audience, allowing artists and spectators, deaf and hearing, to enjoy both the same and simultaneous artistic experience. Sign and Sound Theater Europe (2017-2019) consists of a group of 9 partners from 6 European countries – Belgium, Bulgaria, Croatia, Finland, Portugal and the United Kingdom. Is an open-ended performance about different or changing abilities and perceptions. It was originally commissioned by Buzzcut Festival in Scotland, and since has been performed at Experimentica festival in Cardiff, Fresh festival in Devon, and IDance in Scotland. It began as a duet by Stuart Jackson and Angus Balbernie, and then became a trio with Katy Dymoke. It can also welcome others to join in as guest-performers if and when the opportunity arises. Angus and Stuart have known each other for around 15 years, working together on projects with Touchdown Dance. Katy is the director of Touchdown Dance. Stuart is blind and autistic, and has toured the world as a dancer. Angus, through a series of full-on attacks of Bells Palsy, has lost much of his hearing, taste, balance and ability to speak clearly 5 years ago. He has created around 85 performance pieces, and taught in many places across the world. Katy is still in one piece, and does loads of amazing things, including directing Touchdown Dance. OUT SIGHT and YOU ARE SAFE are the result of the challenge presented to the choreographer Silke Z. to work with several Portuguese dancers in exchange with the ResistDance dancers, in a new creation on the dialogue between the question of peer group and doctrine of masses versus the individual needs, feelings and freedom. Grouping is, in both pieces, a place of feeling safe and navigating through the world but also a place of detaching from your own self and functioning. The solo, individual moments, are the moments when we are on one hand, left out or feel isolated and panic but on the other hand, feel what we need and who we really are. The current dance performance by Silke Z. deals with questions about the (in)controllability and effects of fear on our soul, our body and our human relationships. Fear becomes more and more obvious in the way it spreads. Silke Z. occupies a key discourse of our time that deals with the core of human and difficult to answer questions. Live electro sounds by André Zimmermann drive a cross-over round of the disclosure of social fears. Silke Z. is artistic director of the Kompanie resistdance and the ensemble Die Metabolisten. She leases the ehrenfeldstudios, a production and performance facility for interdisciplinary and intergenerative dance in Cologne. In addition to her own productions, she is researching the phenomenon of immediacy in dance within the framework of a doctorate, and from WS2018 she will be a lecturer in the MA programme Szeniscge Forschung at the University of Bochum. ALI (Wings) is the story of a meeting between an ordinary young man, a little disillusioned and pessimistic, and an individual with two red wounds on his shoulders, a fallen angel who wants to suffer and love like all human beings do. The angel, descended from heaven on a pole of light, is always questioning, wanting to know the reason for everything. He is curious and naive like a child. The two establish a network of mutual questions, of curiosity, of conflicts that make the angel discover feelings and sensations never experienced before. Teatro la Ribalta is a professional theatre group in which performers with and without physical and mental disabilities work as an ensemble. The actors give passionate expression to their artistic potential: they dance their individuality poetically and act with convincing credibility. The productions are energetic, touching, and evocative. Over years of collaboration, the Academy of Diversity was created. This diversity includes culture, theatre, dance, education, discussions, and artistic and social development. The mission is to counteract exclusion and to give all involved a professional and social identity.